The title direct tells you what's the aim of the map, and even it could remember for some you a great movie, it doesn't real have a link with it. So you main objective is to proceed through this 'enemy nest' to find a exit and leave this quite unconfortable place. Design is interesting and correct to above average but regarding to the amount of level Dave released for Soldier of Fortune I I'm not surprise. the scale is good, the architecture is also well put together with some good balance through the general layout in a non monotonous theme. There are some minor flows in this release like the unrealistic cave through is to low ceiling, the emptyness of the main building where no environment object have been put and the way your progression has been canalized by mines field in the open area. Gameplay is simple but quite challenging (not taking in account the frustrating escape of the cell). 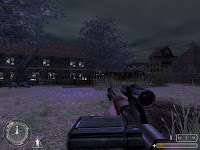 On every corner there is a german soldier waiting for you, open area will also provide some nasty traps done by nazis shooting though broken windows, progression is obvious and agremented by some minor objectives to achive. End of the map isn' t evident to find but sounds logic even if i would have espect something more surpizing. In conclusion: i really taught after more than 10 attempts trying to escape the cell that i will never finish this one, hopefully i tried another couple of time and finally succeed to go further. I was happy with it and really found the whole release quite realistic and enjoyable even if short and not perfectly put together. Another well worth to play release.